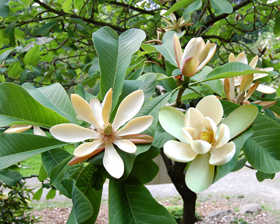 A rare tree with an exotic appearance, Magnolia officinalis var biloba has very large leaves (up to 40 cm long) with a a deep notch at the apex, giving the leaves a bi-lobed shape. Once established, it has large, white, saucer-shaped flowers although they can take many years to appear. Magnolia officinalis var. biloba is hardy but requires a position sheltered from strong wind or the attractive leaves can be shredded.